We had a team of 9 yearlings for the Premier sale at Doncaster which sold adequately without producing any stars this time. In the Silver Sale we sold the second and third top lots – a very imposing Havana Gold colt who made 45,000gns and a Bated Breath filly for 32,000gns. Well above the average for this particular sale. Tattersalls December Foal Sale proved successful for us with 6 foals averaging 37,000 gns, the best price of 100,000 guineas being attained for a homebred son of Kyllachy out of Mabinia . We also had a good price of 42,000 gns for a son of Garswood out of Lawyeers Choice. We took four nice foals to this sale including a Poet's Voice colt and a Sepoy colt for Peter and Sylvia Tellwright which made £25,000 and £15,000 respectively. The Mastercraftsman colt for Hunscote Stud was led out unsold at £58.000 but all being well will be back for another go in the Autumn. The homebred April born colt foal by Pivotal out of Aiming sold really well to Kingswood Stud for £120,000. 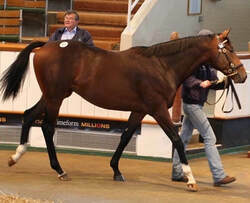 We had a good big colt by Beat Hollow to sell here and he made £26,000 to Tom Malone. This was a very difficult sale coming after so many previous days of selling. I was hard for purchasers to get round all the horses and pick out any nice ones but we had a smart one to sell for Elite Racing Club, a Kyllachy colt out of China Tea which made £26,000 on a very difficult day. Here we sold a very nice filly by Authorized, the first foal of our mare Archina, for £75,000 which we were delighted with and wish all the connections the best of luck with her. With just 5 yearlings to produce at Doncaster Premier Sale in August we had a very reasonable sale across the board. Mark Windsor's two fillies which he pinhooked as foals made a healthy profit with the Compton Place filly going to Simon Dow for £12,000 and the Harbour Watch filly going to Peter and Ross Doyle for £45,000. A nice Canford Cliffs filly belonging to the Middlebrooks made £54,000 and a Dutch Art filly out of Royal Whisper belonging to The George Smith Family Bloodstock rounded off proceedings making £68,000 to Cheveley Park Stud. The best of the mares we had to sell this year was Royal Whisper by Royal Applause out of Never A Doubt, the property of the George Smith Family, she realised 60,000gns to John Warren. We had some good prices for foals including a Rip Van Winkle colt out of Happy Holly, the property of Hunscote Stud, which sold to Camas Park Stud for 85,000gns. Homebred colt by Lawman out of Whatami made 47,000gns to Jonnie Portman and homebred filly by Exceed and Excel out of Madame Ninette realised 80,000gns to Oliver St Lawrence Bloodstock. The sale started quietly for us with the best price on the first day attained for a Lawman filly ex Vespetta (Fr) at £40,000 to Sackville Donald. On the second day we sold seven horses. attaining £58,000 for the Compton Place filly ex Canukeepasecret owned jointly by ourselves and Jack and Jo Berry, she was sold to Emma Armstrong. We received £24,000 for a colt out of Choosey Girl by Kheylef to go to Kevin Ryan. A nice Approved colt belonging to Arrow Farm and Stud made £38,000 to Shadwell. Mark Windsors very attractive filly by Compton Place ex Midnight Sky made £25,000 to Antony Stroud, who also purchased our final lot. the Dutch Art filly out of My Girl Jode for £52,000. We set out in 2013 knowing that we did not have as much ammunition as in previous years and were very pleased to sell a homebred colt by Kyllachy out of Choosey Girl to Anthony Stroud for £55,000 at the Doncaster Premier Sale. Part 1 at Tattersalls was disappointing with the Rip Van Winkle colt out of Aurelia bruising a foot prior to sale and having to be withdrawn, needless to say he was sound the next day and is due to re-appear in December Sales. In part 2 we were a little disappointed in the Royal Applause colt out of Madam Ninette only fetching 26,000 gns but wish his new connections all the very best with him. The Paco Boy colt out of Bolshaya made 28,000 gns and is going to Richard Hannon, we hope to see him winning next year. The Acclamation colt out of Tatiana Romanova (USA) made a satisfactory 90,000gns to Shadwell Estates and the Vale of York colt out of Endless Peace also a satisfactory 28,000 gns to Armando Duarte. We kept the Exceed and Excel filly out of Whatami as we felt she did not reach her true value in the ring with her pedigree open to so much improvement and shall look forward to running her and hopefully breeding from her later on. We had great December Yearling Sale, achieving 200,000gns for a Rip Van Winkle colt out of Aurelia. He had to be pulled from Book 1 after bruising a foot shortly before he was due in the ring but went on to top the sale in December for his delighted owner breeder Richard Mosses. The opening Bloodstock Sale "The Doncaster Premier Sale" held on August 29th and 30th treated us kindly this year. We began with a nice Myboycharlie colt ex However (LOT 93) for new clients, Arrow Farm Stud, which realized £30,000. Regular clients, whose mares board here, George and Jackie Smith sold (LOT 192) a Medicean colt ex My Girl Jode for £20,000. Then we were delighted to get £75,000 for our homebred Dutch Art filly, ex Penchant (LOT 228). 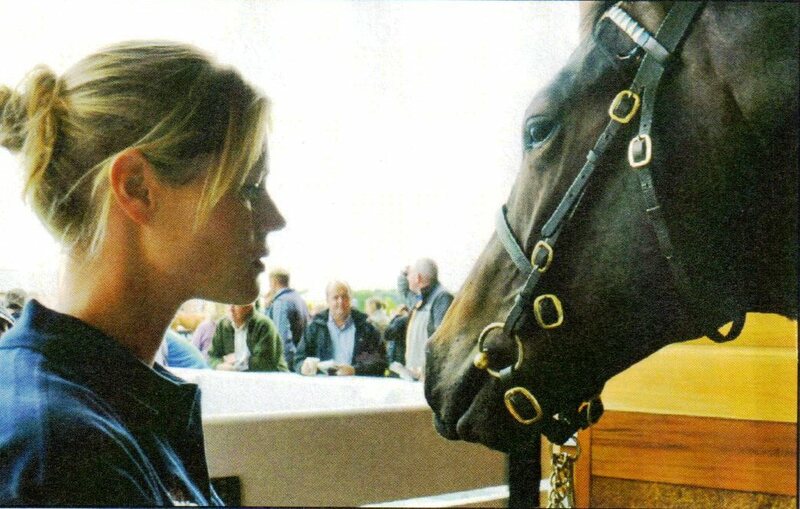 Bought by David Armstrong, who also owns the highly regarded full brother, Garswood, trained by Richard Fahey. On the second day we began with two nice horses belonging to Gary and Leslie Middlebrook. LOT 277 a colt by Teofilo ex Saint Ann realized £52,000 and LOT 415 a filly by Myboycharlie ex Anagram made £18,000. Also longstanding clients, Messenger Stud, whose Sleeping Indian colt ex Anytime Baby (LOT 422) made £22,000, to Hugo Merry, to be trained by Ed Dunlop. Finally, another homebred filly (LOT 475) by Royal Applause ex Choosey Girl made £20,000 to Rabbah Bloodstock. All in all at very satisfactory couple of days. We approached the sales in 2011 with slight fear and trepidation, owing to the economic climate of the country, but as with a great many other studs, ‘Furnace Mill Stud’ was pleasantly surprised with the outcome. Lot 253 by Kheleyf ex Madam Ninette (homebred) made £75,000 to John Ferguson. Altogether, we sold 6 out of the 7 yearlings we consigned at an average of £37,400, well above the sale average. In October we moved to Tattersalls for two weeks. In Part 1 we had an amazing sale, we took three horses that sold for a total of 1.09 million guineas, including the top priced colt for 700,000 gns. In Part2 we sold 6 out of the 7 yearlings we consigned for a total of 113,000gns averaging 18,800 gns. Part 3 was a great deal harder but we did mange to sell 8 out of the 10 yearlings consigned.